Can anyone provide a working example for creating a visual swatch (or even a text swatch) attribute as part of a setup script. 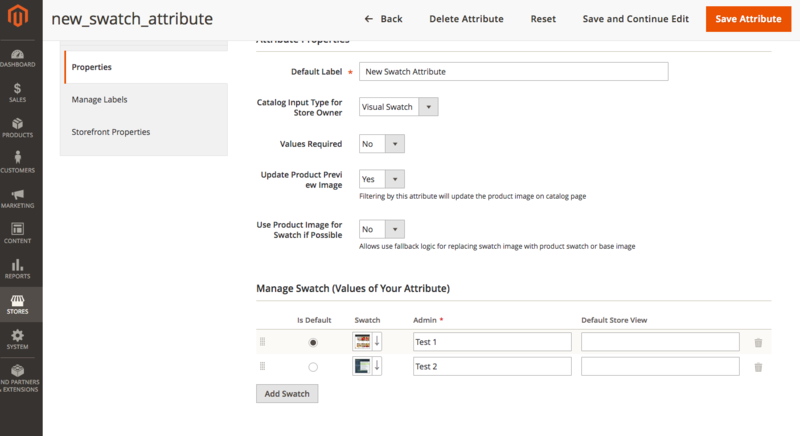 I've tried the example on Magento 2 create custom swatch attribute programmatically but it doesn't work for me. The issue I've ran into there is that the the attribute repository cannot find the new attribute that was created. I tried putting some cache clearing in between but no luck. Disclaimer: Parts of this code were taken from Magento_SwatchesSampleData core module. Also you might not need colorMap but I just put it there. This code was tested on Magento 2.1.4. I assume you have an extension called Goivvy_Custom. I also assume you know how to install the extension and have magento run install scripts. The code below will create new_swatch_attribute Visual Swatch. Not the answer you're looking for? Browse other questions tagged magento2 swatches or ask your own question. Magento 2, Text Swatch, can't turn off “Visible on catalog pages”! Magento2 : Custom Category Attribute value Not Saving?